Generosity is reflected with the open floor plans, French windows and bright, large bay windows. Apartments ranging from 1- to 2-rooms and 3- and 4-rooms up to 8-room living concepts: quality of living as required. The design of the entrance areas, staircases, apartments and bathrooms convinces with exclusive materials. The bathrooms are a creation of the Munich interior designer Nora Witzigmann. The architecture of the renowned firm of architects Hilmer Sattler Ahlers Albrecht emphasizes the old town character of the surroundings while creating at the same time contemporary living quality at the highest standard. LIVING IN MUNICH. LIFE IN THE BAADER GLOCKENBACH. In the Baaderstraße, in the immediate vicinity of the Isar river, new will be built by 2021 meeting the highest standards. Discover the Baader Glockenbach Block and experience life in the center. A home to come home to. Living environment that meets the most exclusive demands. In Munich, a city to experience and enjoy. In the Glockenbach, in the midst of life. We have developed this residential building with dedication and attention to detail. For people who value quality. For individuals who appreciate a top-quality home. 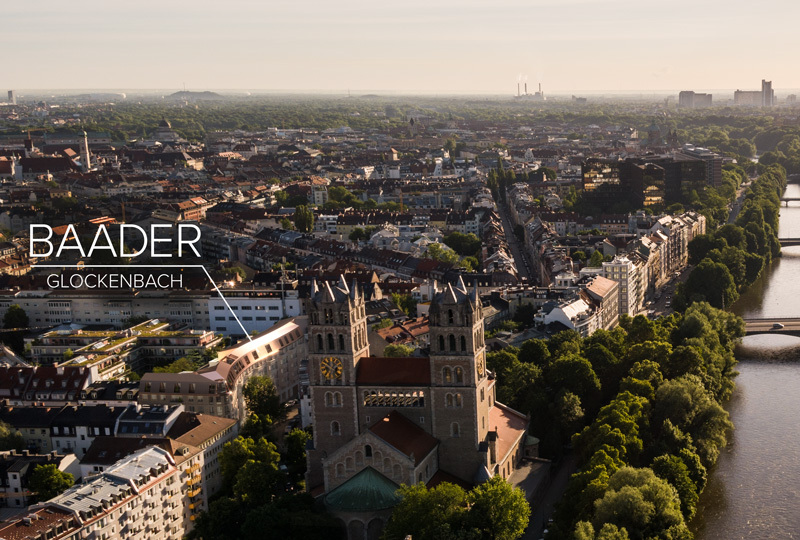 The BAADER Glockenbach is centrally located in the Glockenbach district in one of the most inner city locations and benefits from a first-class infrastructure. In the immediate vicinity: the Isar with its extensive meadows. The Viktualienmarkt in the heart of the city is only a short walk away. MUNICH IS ONE OF THE ECONOMICALLY STRONGEST AND SAFEST LOCATIONS IN GERMANY. THE PROPERTY IS LOCATED IN THE GLOCKENBACH DISTRICT, ONE OF THE MOST SOUGHT-AFTER INNER CITY LOCATIONS IN MUNICH, IN THE IMMEDIATE VICINITY OF THE ISAR. TIMELESS ARCHITECTURE BY THE RENOWNED ARCHITECTS HILMER SATTLER ARCHITECTS AHLERS ALBRECHT. TOP QUALITY FITTINGS: FROM OAK WOOD FISHBONE PARKETT, STUCCO ELEMENTS AND PANELLED DOORS TO Q3 PLASTER SURFACES AND NATURAL STONE IN THE STAIR CASES. SUBLIME QUALITY OF LIVING: BALCONIES, TERRACES, LOGGIAS, BAY WINDOWS AND FRENCH WINDOWS.